For decades, scientists have been debating what it would have looked like when a chunk of Earth broke off and formed our Moon some 4.5 billion years ago. And now new chemical evidence suggests that things were way more violent than we’d assumed, with researchers suggesting that the impact that set our Moon free was "like a sledgehammer hitting a watermelon". It’s well-established that the Moon was once a part of Earth before it was sloughed off the side and thrown into our orbit, but the circumstances in which this 'great uncoupling' occurred has been a topic of heated debate. Until recently, the most widely accepted hypothesis for how the Moon was formed suggested that a Mars-sized object (sometimes called Theia) once collided with the still-developing Earth, about 20 to 100 million years after the Solar System first came together. While our young planet appears to have come out of the collision fairly unscathed, the impact would have caused Theia's core and most of its mantle to sink into and merge with Earth’s own core and mantle. Of the remaining dust and debris that were ejected into Earth’s orbit, a small accretion disc was formed, and from this, our Moon eventually took shape. While this encounter might sound pretty violent, the consensus among scientists for almost five decades has been that Theia made a fairly low-energy graze across the surface of Earth. This hypothesis, known as 'the giant impact', went on to explain all kinds of other things - such as the large size of the Moon relative to Earth, and their separate rotation rates - and there’s a whole lot of evidence to support it. But there was always one big problem with this hypothesis. It would make sense that a large portion of the material that makes up the Moon would have come from Theia, but chemical analyses on samples brought back by the Apollo missions in the 1970s indicated that Earth and lunar rocks were nearly identical. Simulation after simulation of the impact predicted that most of the material (60 to 80 percent) that formed the Moon would have come from the impactor, rather than from Earth, and it was extremely unlikely that Earth and Theia had the same chemical make-up. 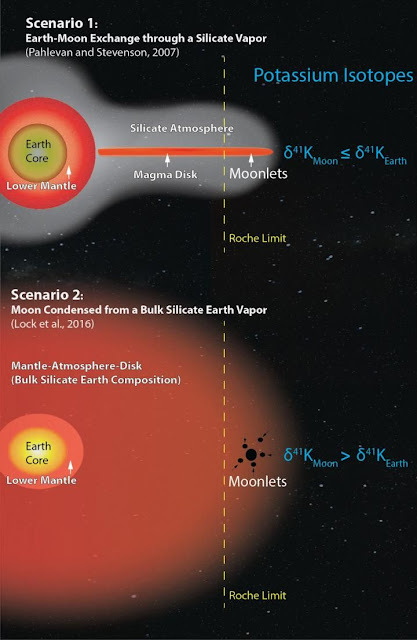 Fast-forward to now, and geochemists from Harvard and Washington University are reporting that a new, more detailed analysis of seven Moon rocks and eight Earth rocks didn’t clear things up like they were expecting - it actually blew the giant impact hypothesis right out of the water. "We’re still remeasuring the old Apollo samples from the '70s, because the tech has been developing in recent years, We can measure much smaller differences between Earth and the Moon, so we found a lot of things we didn’t find in the 1970s. The old models just could not explain the new observations." one of the team, Kun Wang from Washington University, told Ria Misra from Gizmodo. In fact, not only did the new analysis find no new evidence of materials that could have come from something other than Earth - it actually suggested that the origins of these Moon rocks were even more tightly bound to Earth than we thought. And there was another neat little detail in there. Every single isotopic signature in the chemical analysis matched up to both Earth and the Moon, except for one: heavy-potassium isotope in the lunar samples. "The collision that formed the Moon wasn’t low energy at all, [Wang] argues. Instead, the impact was extremely violent, pulverising most of Earth and the impactor, and turning them into a vapour. In this scenario, the vaporised Earth and impactor mix together into a giant dense atmosphere. This atmosphere then cools and condenses into our planet and its satellite." While no one's come out to dispute the claims outright, the onus is now on Wang and his team to make their hypothesis more convincing and weighted in evidence than the one we've been carrying around for almost 50 years. And that involves demonstrating how seven lunar samples high in heavy-potassium isotope can accurately represent the Moon’s overall potassium composition.